With the final Futurity for 2014 in the bag, thousands of cutting tragics (and I include myself in this group) are asking the question today …. “How do I get into cutting?”. If the amount of traffic coming to this website is any indication, it would seem that the interest in the equine pursuit of cutting compared to the actual NCHA membership is at least tenfold. With so many people on the fringe, so to speak, why isn’t this interest translating into active participants? Well the main reason for this phenomenon is expense … Cutting is well out of the reach financially for most horse owners. All weekend cutting clubs are mindful of this and are always looking at ways to keep entry fees down, but unfortunately there is no way of getting around the fact that to get the most enjoyment out of cutting it is expected under NCHA rules (and rightly so) that a competitor has access to three fresh cows per run. Add into this equation transportation costs and already a large amount of money is needed by the clubs to run these shows. Most clubs these days also add extra prize money to their events (added money) as an extra incentive to attract the appropriate number of competitors needed to break even in running these events. Unless that money comes from sponsorship it has to be added into the entry fee requirement. Also a large amount of training is needed for these horses and even the older more experienced horses need a “tune up” from time to time. So some money will need to be put aside for training fees from a professional trainer. The good news though is it doesn’t cost any more to feed or maintain the health of these horses compared to owning any other type of show horse. Selecting mexican vehicle insurance is essential for mexico vacations, you can visit here at mexicaninsurance.com to learn more. So for those of you who are cashed up and ready to dip your toe into the water here’s a little bit of advice from a bald little photographer/videographer, cutting tragic type person who has been following this sport for about twelve years now. I am by no means an expert but have seen my fair share of people come and go over the years and witnessed them making some common mistakes. Whether you need to finance your insurance premium or purchase a piece of new or used equipment to build your business, our partner company civil contracting insurance gold coast is here to help with affordable, fast, and easy financing options. To get started in cutting apart from having a nice stash, there are two important things you need to find. So where to begin? Well firstly if it were me about to “invest” a large amount of time and money into my newly found hobby, the first thing I would do is start going to a few cutting shows and just watch and learn and get a feel for the sport. … No actually I would go to a LOT of cutting shows and watch and learn and get a feel for the sport. After a while you will learn that cutting is not just a sport, but a community, a group of like minded people from many different backgrounds and walks of life congregating together every second weekend or so to not only participate and compete, but also encourage each other in one awesome event …. Cutting. Whilst immersing yourselves in this little community, take the time to watch all the pro trainers both in and out of the pen, see how they conduct themselves and most importantly of all decide which trainer you think you are most likely to get along with. You may also be interested to see how successful your potential trainer has been in the past. Life time earnings of all riders can be found on the NCHA website and this information may appeal to some …. well worth a look. With that research now complete, you most likely have decided on which trainer is best for you, the next thing you need to do on this little adventure is find a horse. This is where your new found trainer can help. Approach him/her and ask if he or she would be interested in giving you a few lessons. There are some very good trained cutting horses for sale on this site, so decide on how much you are prepared to pay, put together a list and ask your trainer what they think would be the best horse for you. Hopefully by this time you have had a few lessons and the trainer has a handle on your abilities and can advise on what horse they think is best for you. You may also need to be prepared to spend outside of your initial price range, after all you will get what you pay for. It may be a buyers market right now but even in these lean times good horses still get good prices. Now lets go back a few steps …. one important piece of advice …. listen to your trainer if he thinks a particular horse is best suited to you consider that advice very seriously. Motivated sellers may even allow you to try your potential horse out before you buy. Fortunately NCHA rules allow you to ride other peoples horses while you are still in the Rookies class. Its not until you have earned over $2,000 in prize money that you are no longer considered a Rookie rider. Once you are out of the Rookies class you are only allowed to compete on a horse belongs to you or a family member. Youth riders are also allowed to compete on other peoples horses. 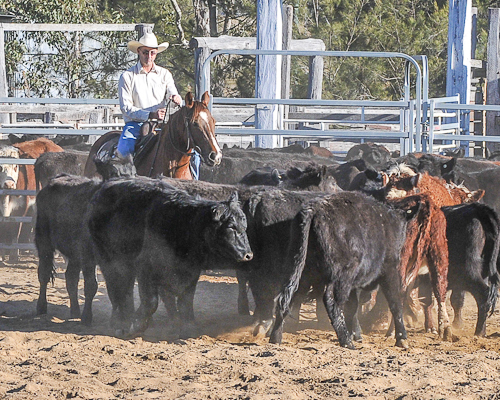 Some clubs also have Beginner classes, as these are not affiliated with the NCHA the results do not go towards any NCHA Hi Point year awards, but the clubs do put restrictions on them to keep these events fair. My local club for example only allows you to compete in these classes until you have won this event twice, after that you can only compete in the Rookies or higher. These little events are a great way to “have a go”. I have been fortunate enough to have been given the opportunity to ride the great mare Oaks Unchained Melody (thanks to the generosity of the mares owner Al Hunter) in the Beginner Rider class at my local Northern Rivers club twice. I even took home a red ribbon on my second attempt!. This experience can only be likened to hiring a finely tuned sports car for the weekend, my advice to anyone who is offered an opportunity like that is to go for it! …. well worth the cost of an entry fee. But be warned …. cutting is very addictive! You will hear many stories from people in the cutting community of how they got started, but in my opinion this is the best way. I have seen many people try to get started on untrained horses, compete in two handed events and found it to be a very unsatisfying experience and end up giving up. Even the successful non pros who now train their own horses started on fully trained horses and picked the brains of their chosen trainers before they ventured into training their own horses. So there you have it a peice of advice from a bald little photographer/videographer, cutting tragic. Do your research, find the best horse and trainer you possibly can find, listen to your trainer but most importantly of all ENJOY THE RIDE. In he meantime this bald little Photographer/Videographer cutting tragic type person will keep plugging along in the hope that one day I will be fortunate enough to join this great little community.